NewScientist ci porta a scoprire come funziona il più preciso orologio del mondo. L'orologio atomico realizzato allo UK's National Physical Laboratory. 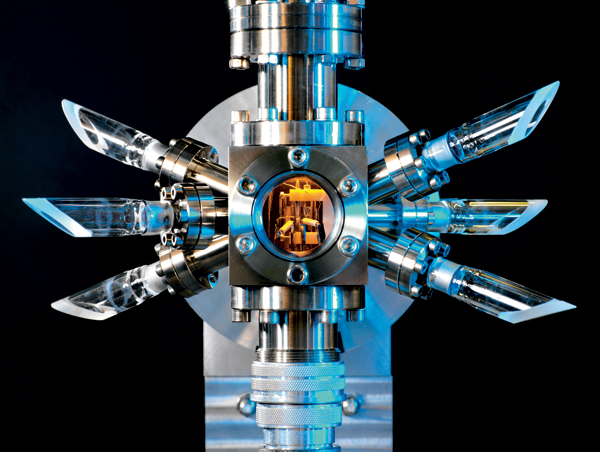 This super-accurate timekeeper is an optical atomic clock built by the UK's National Physical Laboratory (NPL) and its tick is governed by a single ion of the element strontium. The ion is trapped in an electromagnetic field within the small cube at the centre and cooled with lasers to just a fraction above absolute zero. The lasers are fired through three of the glass shafts emanating from the cube, but must be carefully directed out of the other side to prevent them scattering within the clock, which is why there are six shafts in total. Once the ion is cooled, another laser makes it resonate between two energy states with an incredible regularity governed by quantum mechanics. It gives off a regular pulse of optical radiation exactly 444,779,044,095,485 times per second.